Combine olive oil, red wine vinegar, garlic, chillies, and herbs into a bowl and mix well to create the marinade. Add the olives and toss through the marinade to coat well. 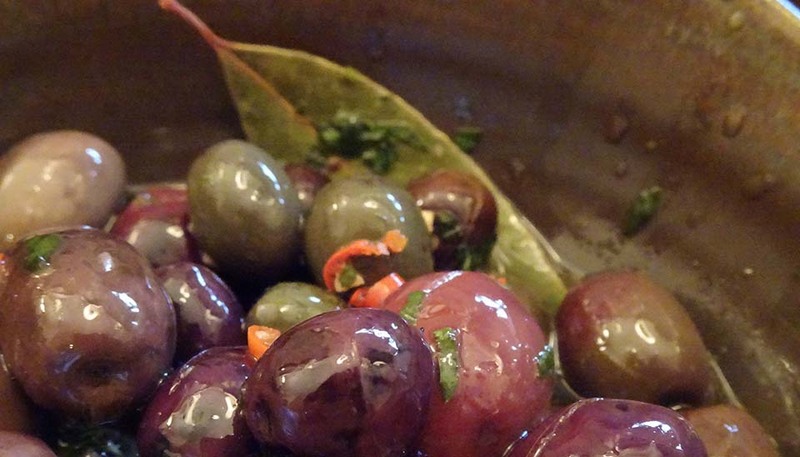 You can place the olives and marinade in a jar if you are not planning to use them within the next couple of days, and keep them stored in the refrigerator until ready to use. If keeping for more than a few days, the olive oil will solidify, don’t worry, just make sure you take the bowl/jar out of the fridge in advance to allow the oil to become liquid again. Source: Adapted from Light and Easy Italian Cooking, 1990, p21, Home Style Library, JB Fairfax Press.